Neurophysiological mechanisms of pain are highly modulated by movement and exercise. Endorphin release has long been known to occur with exercise, but the molecular basis for these links is not well understood. The final approach for risk assessment is to measure biological signals from each subject to capture the unique ways people perform their jobs and then use sophisticated anatomical, biomechanical, and physiological relationships to assign forces to the tissues. A formal assessment of posture includes an assessment of sitting, standing, and lying. Pain is present because the back is currently a weak link. Functional tests help to sort out why the back is a weak link and help indicate what is required to bolster the deficit. Given the wide variety of patients with low back issues, we cannot expect to succeed in low back rehabilitation by treating everyone with the same cookbook program. The following strategies will help guide clinical decisions to individualize - and thus optimize - the rehabilitation program. 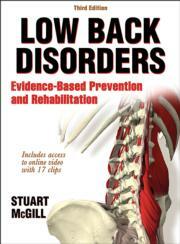 Low Back Disorders, Third Edition With Web Resource, written by internationally recognized low back specialist Stuart McGill, guides readers through the assessment and treatment of low back pain, providing evidence-based research on the best methods of rehabilitation and prevention of future injury. A reference for physical and occupational therapists, sport and orthopedic physicians, rehabilitation specialists, athletic trainers, and fitness specialists. Also useful for students as a primary or secondary resource on biomechanics and low back disorders. Ancillaries are free to course adopters and available at www.HumanKinetics.com/LowBackDisorders. Image bank. Includes more than 500 photos, illustrations, and tables that are found throughout the book. These images are organized by chapter and can be used in classroom presentations, handouts, and activities. Web resource with online video. Includes 20 fillable Handouts for Patients and Clients that can be edited and printed to provide clients with valuable information. Many of the forms also appear throughout the book as demonstrations of their functionality and purpose. Additionally, 17 video clips demonstrate various exercises for rehabilitation and strength. Most videos include author of Stuart McGill’s explanations of techniques and benefits. Videos bring content to life and help readers understand key concepts so that they can apply these techniques with confidence.